What is High Blood Pressure (HBP)? High blood pressure (HBP) is a serious condition that can lead to many health complications such as coronary heart disease, heart failure, stroke and kidney failure. The medical term for HBP is Hypertension. A person with Hypertension is hypertensive. The human body has a network of blood vessels that supply blood to every corner of our body. Blood vessels that carry Oxygenated blood (blood enriched with Oxygen from the lungs) from the heart to the rest of the body is called the Arteries. Blood pressure is the force with which blood is pumped from the heart, and travels though the major arteries of your body. 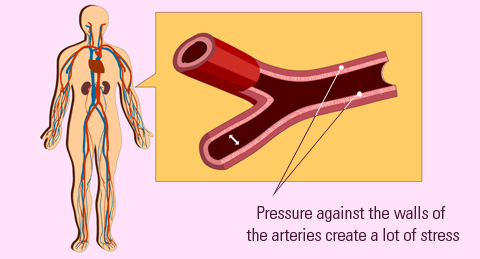 When this pressure is too high over a long period of time, it puts strain on the walls of the arteries, and that begins to create complications. Sometimes, a narrowing of the arteries mean that the heart has to work harder to force more blood through, and again, this puts strain on the heart. There are no real signs that suggests that a person has HBP. Occasional dizziness, loss of breath, dizzy spells and head aches are only a few general conditions a person might experience. Usually, the HBP may be at a very dangerous stage when these symptoms begin to show, and by then, a person may be developing complications. Copyright © 2016 eSchooltoday in association with BusinessGhana.com.